The origin story of Superman relates that he was born Kal-El on the planet Krypton, before being rocketed to Earth as an infant by his scientist father Jor-El, moments before Krypton’s destruction. 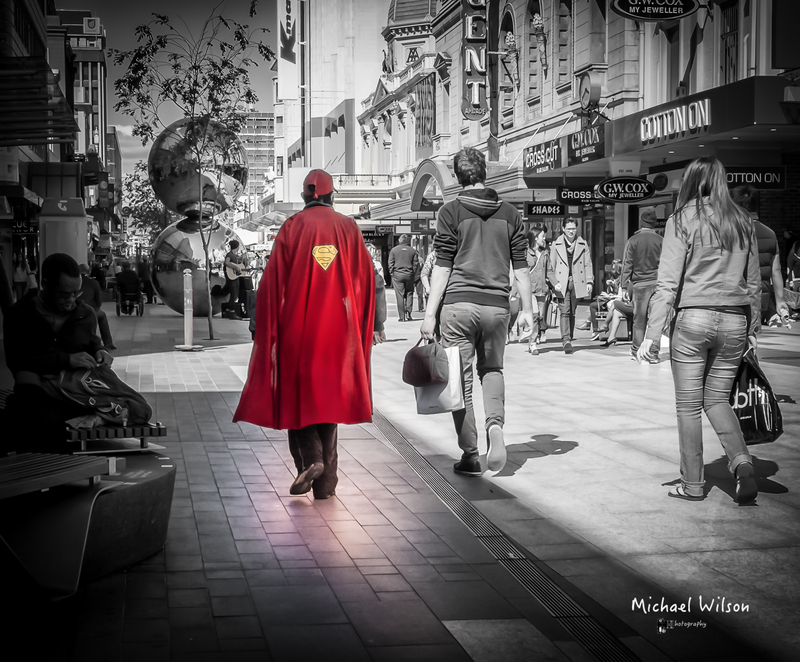 This entry was posted in Photography and tagged Adelaide, Adelaide Street Photography, black & white, City, color, Fujifilm x100s, Lightroom, Photography, Silver FX Pro, South Australia, Street Photography, Superman. Bookmark the permalink. Wonderful image. I love how you have retained the red reflection around his feet. This is a real winner. and I am happy how it turned out. I guess the City is so used to seeing there Superhero, he becomes juts part of the Street Scene.